I am an igneous petrologist/volcanologist with a passion for understanding how magmatic systems work. 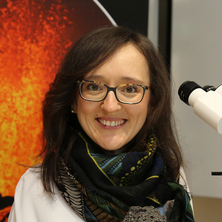 I apply high-resolution petrology, geochemistry and geochronology to diverse geological questions, and my current research focuses on why, how and when volcanic eruptions start. I am particularly interested in minerals hosted in volcanic rocks as they provide a detailed record of magmatic processes through time. My approach combines field observations and detailed microscopy with state-of-the-art analytical techniques and geochemical modelling at the mineral and melt scale. I am fortunate to study a wide range of active and past volcanic systems in different tectonic settings around the world. I joined UQ in July 2016, after holding a postdoctoral fellowship at Trinity College Dublin for 2.5 years. I undertook my postgraduate research in Spain and The Netherlands (Vrije Universiteit Amsterdam), and received my PhD from the University of Zaragoza in December 2013. I was born and raised by the sea, in San Sebastián. Gale, C., Ubide, T., Lago, M., Gil-Imaz, A., Gil-Pena, I., Galindo-Zaldivar, J., Rey, J., Maestro, A. and Lopez-Martinez, J. (2014) Quaternary volcanism in Deception Island (Antarctica): South Shetland Trench subduction-related signature in the Bransfield Basin backarc domain. Boletin Geologico y Minero, 125 1: 31-52.